A member of the German Parliament has offered Tommy Robinson asylum in Germany following his arrest for livestreaming outside the trial of a child grooming gang. 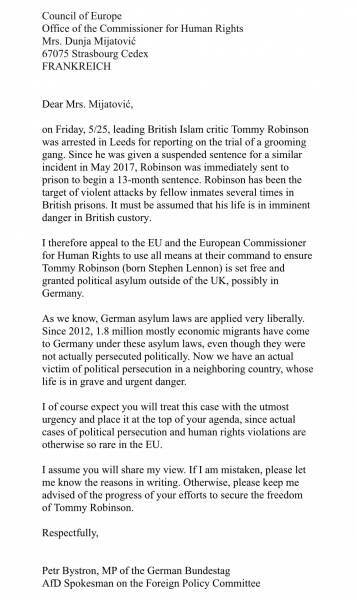 He has now sent a letter to the imprisoned British activist and independent journalist offering to fly to the UK so that Tommy Robinson may sign the asylum paperwork in prison. 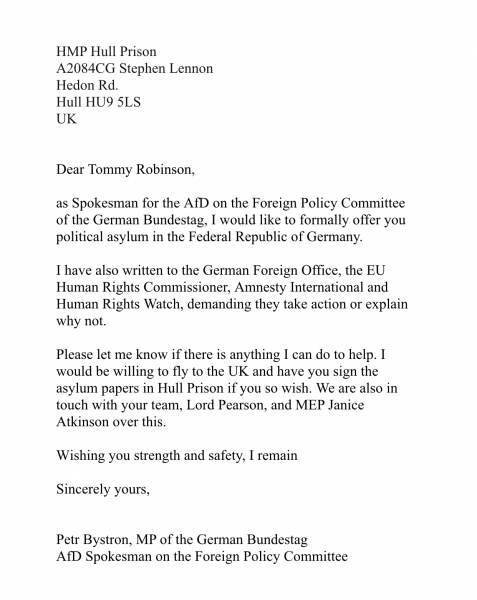 In letters provided to The Gateway Pundit, Bystron wrote to Robinson as well as the European Office of the Commissioner for Human Rights, the German Foreign Office, Amnesty International and Human Rights Watch. “Please let me know if there is anything I can do to help. I would be willing to fly to the UK and have you sign the asylum papers in Hull Prison if you so wish. We are also in touch with your team, Lord Pearson, and MEP Janice Atkinson over this,” Bystron’s letter continued. Bystron’s office explained to The Gateway Pundit that Robinson signing the asylum paperwork would be the first step in. Robinson’s lawyer, Matthew Harding, told Leeds Live that his client being imprisoned would put him in grave danger. Bystron told the Gateway Pundit over the weekend that he believes the freedom of speech to be under attack all across Europe. “Freedom of speech is under attack all across Europe. I was at the AfD march in Berlin today, where people were waving #FreeTommy signs. I grew up under Communist dictatorship, and I will not let our freedoms be taken away again,” Bystron told The Gateway Pundit on Sunday.